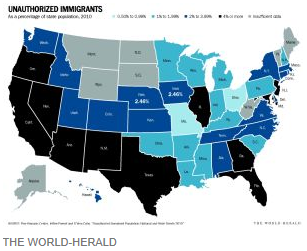 Today’s Omaha World Herald has an excellent article, “A Window on Immigration.” It points out that 2.46% of Nebraska residents as of the 2010 census were illegal immigrants. This works out to about 45,000 illegal immigrants in Nebraska today compared to just 3,000 as recently as 1980. This is really a shocking figure. It is roughly the same as the population of Nebraska’s fourth largest city (Grand Island) or Nebraska’s fifth largest county (Buffalo). Nebraska’s unemployment rate of 3.9% is really a labor shortage. It needs these 45,000 illegal immigrant workers! Give all businesses a limited time period, perhaps six months or a year, to present a list of their current employees who are illegal. Everyone on this list without a criminal record would receive a guest worker visa along with all necessary legal papers. These papers would belong to the individual worker who could use them to change employment from one business to another. Going forward, businesses would be authorized to hire additional foreign workers as needed who would automatically qualify for guest worker visas. Such visas would be granted in the country of origin thereby avoiding the need for illegal entry into the U.S.
As of a certain date in the near future, all businesses would be required to periodically demonstrate the legal status of all workers on their payroll. Penalties for non-compliance would be severe. Guest workers would be eligible to apply for citizenship after a relatively lengthy period of time, perhaps five years or ten years. Once an adequate guest worker visa program has been set up and is operating efficiently, allowing all businesses to hire as many foreign workers as they need, security on our southern border with Mexico would be no more of a problem than is security on our northern border with Canada. In other words, illegal immigration is an economic problem, not a law enforcement problem. The way to solve this problem is to address it correctly!